Ok ok so I am a little late with this post since Talk Like a Pirate Day is September 19, my apologies, but either way this excellent book series is going to get mentioned in honor of Talk Like a Pirate Day. 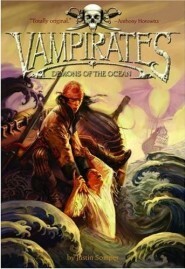 Today’s book spotlight is on an ongoing series that has been out for a few years now, Vampirates by Justin Somper. Just reading the genius name alone you know it’s going to be good, I mean, vampires + pirates = pure awesome. Right? So, Vampirates is a children’s series, meant for ages 9-12, but I say you are never to old to read any book, so don’t let that keep you from checking it out. So far this series has four books in it, but I don’t want to ruin the story for anyone so we’ll just talk about the first book, Demons of the Ocean. A tale as old as true. Vampirates: Demons of the Ocean is about Connor and Grace Tempest, two children that grew up in a lighthouse listening to their father’s sea shanty about the Vampirates and their ancient ship that haunts the ocean blue. After the death of their father leaves the kids poor and orphaned, the 14-year-old twins run away to sea and are separated by a horrible storm. Connor is rescued by a pirate ship, where he soon finds a place among the crewmates aboard. But little Grace on the other hand has been rescued by a dark and mysterious ship, the ship of the legendary Vampirates. The siblings become involved with the internal politics of each vessel, meeting new friends and new enemies, like the vampire Sidorio. The Vampirate ship fills Grace with horror but also wonder. Her protector, Lorcan, and the living figurehead, Miss Flotsam, offer kindness and clues to the ship’s many mysteries. Then you have the adventurous, classic pirates that Connor loves (as well as the reader). The book is full of twists and turns and leaves you wanting more, and lucky for us, there are 4 books for us to get lost in. Keeping with the Talk Like a Pirate Day theme, you can go here, copy and paste this post into the box and read it all in pirate speak. Haha, yay! i love the series it rocks im on book 3!